…an old friend where the bún bò Huê and fresh, house-made hot soy milk (along with most of the menu) set an exemplary standard rarely followed by our plethora of same old, same old pho parlors. Bosa’s version practically uses the whole cow making the rich, spicy and savory broth, and you can expect to pull one or two pieces of meltingly tender, yet unrecognizable, pieces of meat from your soup stew — which is, after all, part of the fun! Take it from our staff, only Chinese food this good could get us inside the Luxor. About the only disappointment was a sushi roll touted (by our very good waitron) as the house specialty, containing everything but the kitchen sink. We didn’t have the heart to tell them that 3″ thick rice rolls containing fried and raw seafood (and who knows how many other accoutrements) is not our cup of meat. If you’re the type who loves I Love Sushi or Sushi Fever, you’ll think you died and went to heaven. Sushi snobs (like yours truly) would rather chew on a rancid Slim Jim. In its defense, the sushi rice was impeccable, as was the cooking and construction. But putting that many flavors and textures into your mouth at once (deep-fried! raw! crunchy vegetables! seaweed! sauces!) is the sushi equivalent of an over-loaded ice cream sundae…and almost as sweet. * ELV has many theories… his motto being: Maybe wrong, but never in doubt. I think your theory is right about people holding back when they don’t know much about the (authentic) Asian food. Maybe if you posted about the egg foo yung, kung pao chicken, or the lo mein, people would have more to say. But when you stray from the less authentic, American-cooked-like-Chinese food, and start talking about the more authentic, people are at a loss. Don’t get me wrong. 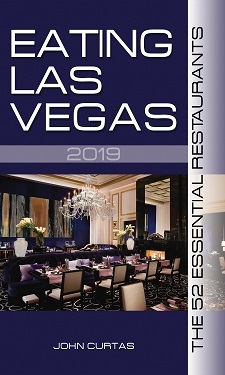 I love reading about the better Asian restaurants in Vegas, and would even love to try some of the cuisine. But I don’t think I’m ready to go all out. I would probably start with something mid-point between the canned chop suey and the beef tendon. Not sure if I’m ready to go all the way yet. ELV, I think you’re right, and you’d certainly be right to not mistake a lack of response as a general lack of interest. For myself, the more obscure the cuisine the more I rely on the reviews of food critics, so please keep this coming. unlike (in a good way) anything I’ve eaten elsewhere. Moreover, I never would have known to try it if it wasn’t for your blog, so thank you for that. I’m pleasantly surprised by your review of Rice & Company. For Chinese food in casinos, my dining options worthy of a second trip have so far been limited to the Gold Coast and Noodle Asia at the Venetian. Everything else has been dumbed down so far and usually marked up so much that it’s just not worth it, IMHO. i think you could have effectively said comments fly at you like asian carp – a. because they are not so popular in america but certainly popular in asia (a delicacy, actually) but b. because they actually do throw themselves at you if you’re on the river with them…. maybe people don’t have comments because they agree with you thoroughly?